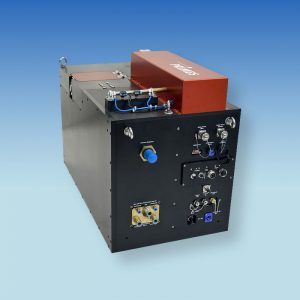 HighPower-MicroSpotMonitor-Industry - Laser Mechanisms, Inc. The PRIMES HighPower-MicroSpotMonitor-Industry (HP-MSM-I) expands the family of camera-based beam diagnostics systems with a reference system for monitoring beams during production with an integrated self-testing function. The HP-MSM-I measures and characterizes the focused beam of brilliant multi-kilowatt fiber lasers in process conditions, records the beam distribution from the fiber and monitors the emitted laser power. The measurement optics and the beam attenuators from the HP-MSM and the familiar camera-based measurement principle are put to use here. Protected by the integrated protective glass changer, the gas flush for the beam entry and the mechanical closing device, a high reproducibility of the measurements is guaranteed. A second fiber from the laser, connected to the fiber adapter, enables the monitoring of the internal optics as well as those that contribute to focusing. In order to generate meaningful measurement data about the position of the focus in space as quickly as possible while production is running, “rapid caustics measurement” has proved valuable. This involves the repetition of a few measurement planes of a reference caustic measurement.